Specialist miners from the Asturias Mining Rescue Brigade have been working all night to try and reach a two-year-old boy who fell into a well in Andalusia in southern Spain 11 days ago. The vertical tunnel, drilled parallel to the original hole that the boy fell down, had to be lined by metal tubing before the miners could go down in a specially made cage to start digging. After the completion of an access platform on the surface, the first two miners were lowered inside the shaft on Thursday afternoon. The miners have been lowered into the shaft in pairs, taking turns to dig a horizontal, four-metre tunnel to access the well from the side. 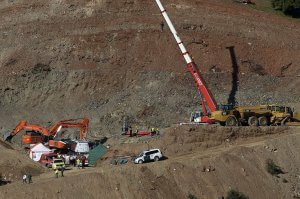 It has been reported that it could take up to a total of 24 hours to dig through the final four metres.